will be gone alone; study alone, walk alone." This is said to be the mantra of one of Japan's greatest 20th-century artists, the boisterous, arrogant and brilliant Rosanjin Kitaoji (1883-1959). Stories of this legendary artist abound, but one particularly revealing of his intuitive genius dates from when he was only three. Rosanjin himself, in 1951, told it to the art critic Kozo Yoshida. "I was taken one day up a hilly path leading to Mount Jinguji behind the Kamigamo Shrine in Kyoto. The area along and around the path was a riot of wild azalea blossoms of burning red. The beauty of the scene with the sun shining brilliantly on it was simply beyond words. Even the air appeared to glisten like a crystal. I was profoundly moved by this fascinating display -- the very first one for me -- of the beauty of Mother Nature, and a sort of determination rose in me to devote all my life to the pursuit and propagation of beauty." Indeed he followed an artistic path all his 76 years, and it can be argued that no other Japanese artist created more works in so many different genres and has had more retrospective exhibitions than Rosanjin (his name means "foolish mountain man"). 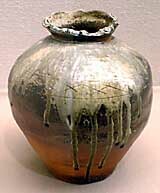 He worked in seal carving, woodwork, lacquer, calligraphy, painting and, of course, ceramics. Another look into Rosanjin's eclectic, yet refined world, is now showing at the Sano Museum in Mishima, Shizuoka Prefecture, until March 17, 2003. 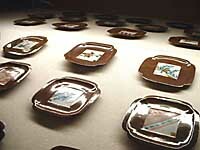 The exhibition is divided according to the four seasons, grouping vessels for use and pictures for display in each. First is a walk through spring and, fittingly, a large overglaze bowl painted with cherry blossoms is displayed. Rosanjin loved to take his themes from nature: Camellias appear in spring, summer brings fish, pampas grass sways in autumn, and snow blankets winter. Antique works were also a grand source of inspiration. 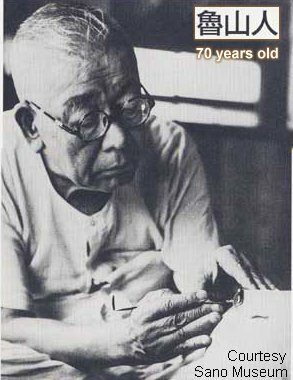 Indeed, Rosanjin had no other teachers than nature and the 10,000 works of art he accumulated in his lifetime. 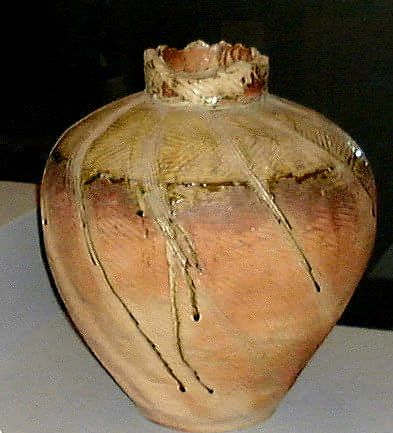 The latter he referred to as his mentors, and they included 3,500 ceramic works. Among that number were 1,350 pieces of Mino and Seto ware, 250 Karatsu works, 270 Korean pieces, and 220 creations by known masters, including Edo-Period pieces by Ogata Kenzan (1663-1743). Rosanjin said that Kenzan's work had a "broad, laconic, powerful elegance of design." The same can be said for all the works in this exhibition, many of which recall -- and, some may say, borrow too heavily from -- those of Kenzan. We see more of this in the autumn section where we come across various sets of momiji (autumn maple leaf) dishes. The sincerest form of flattery may be imitation, but with Rosanjin it can often border on brazen pilfering.  Yet, that was Rosanjin -- though he also said, "I do not try to imitate them [antiques] in any superficial way. I try to go straight to their inner value, their essence and spirit." That is a hard quality to evaluate objectively, yet there's no doubt that a unique spirit does infuse all of Rosanjin's work. I was captivated in particular by a folding screen (1940) depicting a large porcelain bowl on which are painted karako (Chinese children) and pines, on which a tiny bird is perched; another screen of bamboo matched with a Ryokan poem (1950-51) also caught my eye. Even his small, tricolored fish-shaped chopstick-rests (1950) have character. Other standouts in the ceramic realm include a porcelain jar with blue overglaze calligraphy (1937); a set of Shino dishes (1953); a shell-shaped Iga bowl (1941); an etched Oribe jar (1954); and a set of 30 small Kutani-style serving dishes (1936) with a rich chocolate border framing their different overglaze designs. In all, 130 works are on display. "People of understanding understand at a word. People of no understanding never understand no matter how you tell them." Sano Museum also has a quaint garden that visitors can stroll around. It's located at Nakata-cho 1-43, Mishima, a 15-minute walk from JR Mishima Station, or take a Tokai bus from stand No. 4. Open 10 a.m.-5 p.m., closed Thursday. Admission 900 yen, 500 yen. The museum Web site (in Japanese only) is www.sanobi.or.jp (opens new brower window) or call 0559-75-7278. I'm looking to gather a small group to take to the museum and other ceramic events for one day -- if you'd like to know more, please e-mail me. For a deeper look into Rosanjin's world, I recommend the Kodansha International book "Uncommon Clay" by Sidney Cardozo and Masaaki Hirano, from which some of the above quotes were taken. Finally, a note of caution for all you collectors who browse antique markets. Almost all pieces touted as Rosanjin's at these markets are likely to be fakes.